Human Rights Watch (HRW) epitomizes the ongoing crisis and moral failure of powerful non-governmental organizations (NGOs) that claim to promote the universal principles of human rights. The following review of HRW’s 2012 activities, particularly in the Middle East, demonstrates that little has changed compared to previous years, and that the same individuals continue to control the organization’s agenda and activities. In particular, HRW’s activities reflect the absence of professional standards and research methodologies; lack of expertise on international law and armed conflict; and a deep-seated ideological bias against democracies in general, and against Israel, in particular. Under the ongoing leadership of Kenneth Roth, these failings, that led HRW founder Robert Bernstein to condemn his own organization in the New York Times in 2009, have continued in 2012. As shown below, Roth’s obsession with Israel was particularly evident in his social media postings. a French newspaper, Liberation, reported that an investigator from HRW offered financial compensation for testimony related to Congolese rebel groups. Rights violations and armed conflicts that are out of the media focus continue to get little to no attention from HRW. 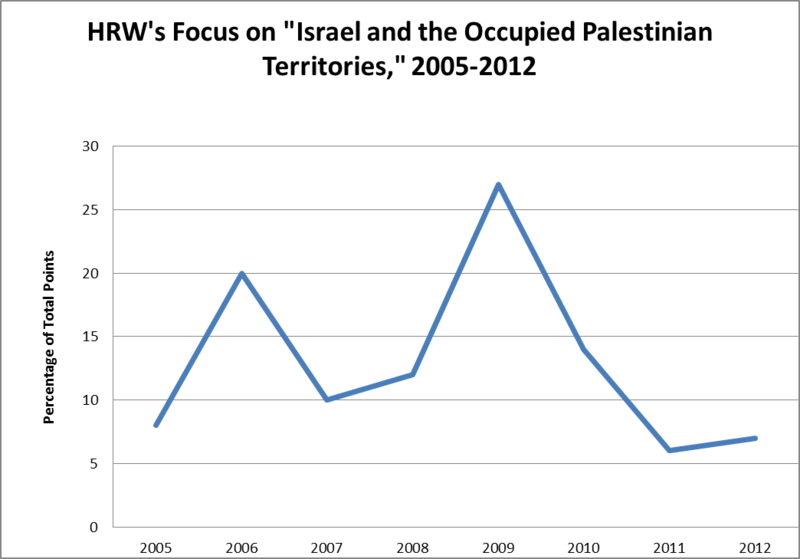 On Israel, while HRW issued fewer condemnations in 2012 in comparison to previous years, NGO Monitor’s quantitative analysis of HRW’s activities in the Middle East and North Africa (MENA) region for 2012 demonstrates that the emphasis continues to be the result of the mix between ideology and the degree of media attention to specific issues. This reflects the ongoing roles of Sarah Leah Whitson and Joe Stork, whose strong ideological agendas have severely distorted MENA’s priorities. Whitson remains MENA director, despite having endorsed the Qaddafi regime as human rights reformers – tainting all HRW statements on Libya – and having led HRW’s fund-raising trip to Saudi Arabia. In November and December, in response to increased violence related to Gaza, the Palestinian statehood bid in the UN General Assembly, and other developments, HRW’s lack of a credible methodology and anti-Israel bias were further evidenced. Disproportionate condemnations of Israeli actions related to Hamas infrastructure erased vital contextual information. And, although HRW issued a statement on Palestinian rocket attacks from Gaza targeting Israeli civilians, this belated publication added no information to the conventional wisdom, and there was no public relations follow-up. In contrast, earlier in 2012, HRW invested significant resources in attempting to spin the court decision on the Rachel Corrie-ISM case for use in the ongoing demonization campaign against Israel. A second article on this topic, in Tablet (“The Human Rights Watch Internal Battle on Iran,” December 6, 2012), contained additional leaked emails from Roth. In one, Roth compared Iran’s religious rulers with a prominent Israeli rabbi, alleging that “Rabbi Ovadia Yosef’s statements [on Iran, Hezbollah, and Palestinians] are arguably more direct than those made by Iranian leaders, and Israel, unlike Iran, has the means to carry them out.” The author, Adam Chandler, criticized Roth for failing to acknowledge that Yosef’s remarks were condemned by the Israeli government and that “he is neither a head of state nor an official who sets government policy,” in contrast to the leaders of the Iranian regime. Roth’s silence and his “quibbling” regarding Iranian genocidal language was also discussed in The New Republic article about HRW “Minority Report,” Ben Birnbaum, April 27, 2010. In 2012, the main military conflict involving Israel took place in November, when the IDF responded following escalating attacks from Gaza. In the wake of this 8-day conflict, HRW published 6 documents, including 5 press releases and a “Q & A”. These examples again highlighted the fact that HRW possesses neither the military expertise nor the necessary fact-finding methodology to make these assessments. (Such judgments require knowledge of the military intelligence possessed by Israeli commanders at the time of the strikes, and information on intent of the officers.) In both instances, HRW’s “evidence” for violating international law consisted solely of Israel’s refusal to explain its operational decisions to the NGO. As in the past, (including a 2003 report on Palestinian suicide bombings), in order to present a façade of balance and credibility, HRW published a press release that condemned “Palestinian armed groups in Gaza” for violating “the laws of war during the November 2012 fighting by launching hundreds of rockets toward population centers in Israel.” (The short document was published on December 24, and was not the subject of an ongoing HRW public relations effort, in contrast to many of its statements on Israel.) It is significant to note that prior to the Israeli action, while numerous rocket attacks were launched from Gaza – each one a war crime – HRW had remained conspicuously silent. In the past decade, Executive Director Kenneth Roth’s obsession with Israel has been reflected in his op-ed articles and social media posts. For instance, in an op-ed ostensibly about eight countries other than Israel (“Barack Obama: Dump These 8 Unsavory Allies,” Foreign Policy, January 2, 2013), Roth opened with a lengthy attack against American support for the nation-state of the Jewish people. Using highly offensive rhetoric and false analogy, he criticized President Obama for refusing to stop the alleged “Jim Crow-like separate-and-unequal treatment of Palestinians in Israeli-controlled parts of the West Bank” and for condemning the politicized legal initiatives targeting Israel (“lawfare”) based on the Durban Strategy. This statement is part of HRW’s wider lobbying on behalf of ICC activism – which included playing a central role in its creation and formulating key articles in the statute – and specifically for opening an ICC case against Israeli officials. Along with the Arab League, the Palestinian Authority, and other NGOs, HRW submitted material to the ICC Prosecutor regarding the 2009 Gaza conflict, in the campaign to persuade him to open an investigation into Israel’s conduct. The Richard Falk episode reflects the longstanding collusion between HRW and various UN human rights frameworks that are exploited for political warfare. This phenomenon, which was also seen regarding the ICC, was most pronounced in the context of the Goldstone Report. Judge Richard Goldstone was a member of the HRW board until after his appointment, when he resigned after NGO Monitor noted the conflict of interest. Yet, HRW lobbied for his appointment and mission, contributed significantly to the false claims and condemnations in the report, and then campaigned for adoption of the flawed and biased recommendations. As the Falk case demonstrates, HRW continues to play a central role in the political corruption of international human rights mechanisms. HRW’s response to the verdict repeated the unsubstantiated rhetoric of the Corrie family, without revealing that the Corrie family’s media contact during the trial, Stacy Sullivan, previously worked for HRW, a clear conflict of interest. On the day of the verdict, an HRW staff member told the Guardian that “The idea that there can be no fault for killing civilians in a combat operation flatly contradicts Israel’s international legal obligations to spare civilians from harm during armed conflict and to credibly investigate and punish violations by its forces.” This assertion, that civilian deaths during war automatically reflect criminal behavior, is a fundamental misstatement of international law. International humanitarian law recognizes that civilian deaths are a regrettable and inevitable part of the lawful conduct of warfare. Civilian deaths are considered illegal when civilians are deliberately targeted or when civilians are killed from a military action that is considered excessive in relation to the anticipated military advantage. As with other statements related to Israel, HRW did not provide any evidence showing that Israel violated either of these principles. Moreover, as part of its ideological bias, HRW falsely implies that Israel does not investigate or punish wrong-doing in combat when such wrong-doing occurs; Israel routinely investigates such allegations and metes out punishment when warranted. The IDF conducted at least three investigations regarding the Corrie incident, and the facts were further examined in a lengthy, fully transparent judicial process. HRW also alleged that “Military investigators repeatedly failed to take statements from witnesses, to follow up with the witness’s lawyer, and to re-interview witnesses to clarify discrepancies.” However, the court flatly rejected claims that the IDF and military police had failed to properly investigate the incident. In fact, as highlighted in the verdict, during the court proceedings, it was the Corrie family that tried to block the State from submitting the full file of the investigations to the judge. Since 2005, NGO Monitor has published quantitative analyses on the activities and publications of HRW’s Middle East and North Africa division (MENA). Our research shows a disproportionate focus on Israel, as well as a deep institutional bias within HRW. For years, HRW neglected the most egregious and systematic abuses in closed Middle East societies, while using its limited resources for campaigns alleging Israeli violations. The years of neglect and disproportionate attention to Israel damaged HRW’s reputation and left it ill-prepared to respond adequately to the violent uprisings and state-sponsored violence against civilians in Arab countries, which continued into 2012. The data suggest that, despite relative improvements in terms of focus on Israel, HRW’s Middle East agenda continues to be driven by media coverage. 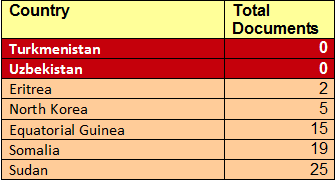 For instance, it shifted its primary target to Syria as public interest in Libya, MENA’s highest priority in 2011, waned (see Table 2, below). Still, serious human rights violations in repressive regime such as Yemen and Qatar remained under-recorded. By failing to preemptively address situations without significant media coverage, HRW will once again be unable to make a real difference if violence further intensifies in those countries. In 2012, HRW issued more reports, press releases, op-eds, and other publications on Syria (92), Libya (58), and Bahrain (48) than on other countries in MENA. Documents on “Israel and the Occupied Territories”  comprised 7% of the 2012 MENA total, slightly above last year’s percentage, 6.83, which was the lowest percentage since NGO Monitor’s annual analysis began in 2005. However, “Israel and the Occupied Territories” (37) still received more coverage than Egypt (31), Iran (31), Tunisia (28), Lebanon (12), Iraq (24), and Yemen (32), and comparable attention to Saudi Arabia (36). In other words, criticizing Israel remains a higher priority for HRW than systematic repression in Iran, violence in Yemen, and the possibility of another autocratic regime in Egypt. The 92 documents on Syria, in comparison to previous numbers on Israel, also demonstrate the disproportionate attention that was devoted to Israel. In 2009, HRW produced a slightly-greater number of documents (99) on Israel, including dozens of statements on the Gaza conflict and in support of the Goldstone Report. Yet, by all accounts, the civilian death toll in Syria in 2012 (60,000) was more than 60 times greater than the civilian death toll in Gaza in 2009. Additionally, in Syria, the Assad regime has been intentionally targeting the civilian population, in particular political and ethnic opponents, whereas the limited number of civilian deaths in Gaza was due to the operation of Hamas and other Palestinian combatants from within civilian areas and/or faulty intelligence. Another indication of HRW’s partial attention to non-democratic repressive regimes in the Middle East is the lack of major reports on certain counties. A report on Algeria has not been published since 2008. Similarly, Oman has never been the exclusive focus of a detailed report, and in 2012, Oman was the subject of a press release for only the second time since 2008. In 2012, two full length reports were dedicated to “Israel and the Occupied Territories.” The first, “‘Forget About Him, He’s Not Here’: Israel’s Control of Palestinian Residency in the West Bank and Gaza,” February 5, 2012, made unsubstantiated claims that Israel was limiting residency permits to Palestinians in order to maintain “demographic control” over the Palestinian Authority, as well as unqualified assertions relating to Israeli security needs. The 110-page document was also accompanied by a media blitz, including a press conference at the American Colony Hotel in Jersualem. The second, the 43-page “Abusive System: Failures of Criminal Justice in Gaza,” October 3, 2012, is one of the few HRW reports on the Palestinians not to blame Israel for a given human rights concern. However, like its December 2012 press release on the rockets from Gaza, this report presented little new information and was issued more than five years after the Hamas takeover in Gaza. HRW offered no explanation as to why it took so long to issue this report despite the massive abuses occurring in Gaza since at least 2007. In addition, MENA focused 50% of its press releases about “Israel and Occupied Territories” on criticism of Israel, 11% on both sides of the conflict, and 39% on human rights violations by the Palestinian Authority and Hamas. These figures represent a significant change from previous years, when HRW systematically ignored on intra-Palestinian violations. In his 2009 New York Times op-ed, founder Robert Bernstein criticized HRW for “cast[ing] aside its important distinction between open and closed societies.” Indeed, this trend has continued. In 2012, Freedom House gave the lowest possible ranking for both political rights and civil liberties to seven countries outside the Middle East: Eritrea, Equatorial Guinea, North Korea, Somalia, Sudan, Turkmenistan, and Uzbekistan. In sharp contrast, HRW entirely ignored two of these countries (Turkmenistan and Uzbekistan) in 2012, and none was the focus of more than 25 total documents. 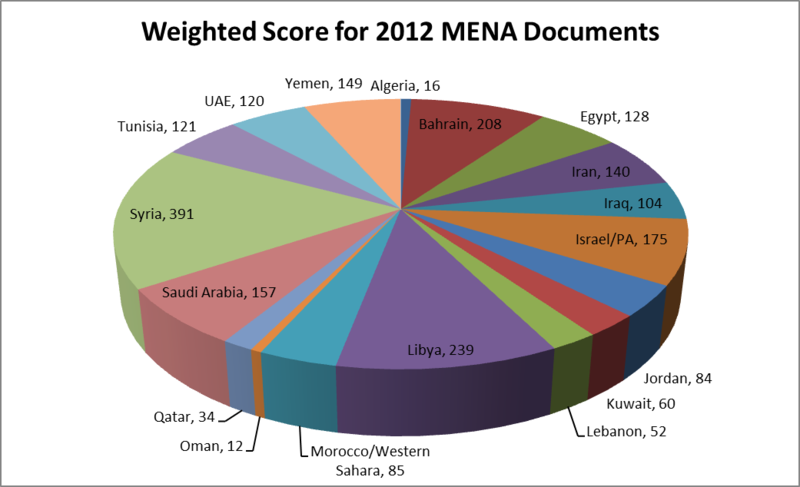 Israel, on the other hand, was the subject of 37 HRW documents in 2012. This section contains the data behind NGO Monitor’s report on Human Rights Watch’s activities in 2012. This term follows HRW’s categorization.